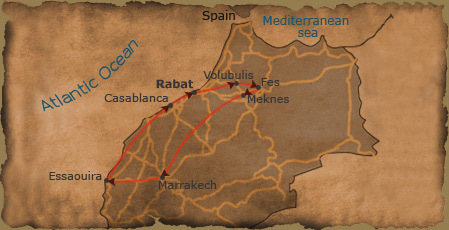 Our tour brings you to the current and historical capital cities of Morocco. Our driver will meet you at Casablanca’s Mohammed V airport. Depending on the time of your arrival, you may go directly to your hotel to check in or you may start the tour of Casablanca immediately. During the city tour, you’ll see the bustling city center with its Art Deco architecture and lovely seaside neighborhoods. You’ll also tour the magnificent Hassan II mosque, which is the second largest mosque in the world and one of the few open to non-Muslims. You’ll return to your hotel in time for a leisurely dinner. Morocco is a very special place, and our goal is to share our love of this fascinating country with you. We want your travel experience to be fun, exciting, interesting, and memorable. We will introduce you to Morocco’s people, culture, and history – not as a tourist, but as an honored guest in our (home).